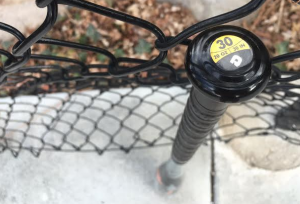 Our 2016 DeMarini Uprising Review (Baseball) comes after a dozen hours of testing in the cage on the field with the drop 10 2 3/4 version of the bat. On the whole, we’d suggest the bat only to those who are looking for a cheap option this year but would also like the guarantee of a warranty from a name brand company. Performance and durability are lacking but not any more than other bats in the price point. We would hesitate buying this bat in the used market as its potential for denting coupled with a lack of warranty might be as good as burning money. We found it to be more liked by those who appreciated a light swing weight—but be careful of hand sting as this one piece doesn’t do much to mitigate vibration. The DeMarini Uprising for baseball bat comes in both a 2 3/4 drop 10 ‘big barrel’ version as well as a traditional drop 13 youth barrel with a 2 1/4 inch max barrel diameter. There is no BBCOR version of this bat. Bats under the same name were produced last year (2015) but in a Junior Big Barrel (built for coach pitch). There are also some softball and fast-pitch bats built with the same name from DeMarini. The DeMarini Uprising has a long list of competitive bats in the sense of a balanced swing in the aluminum single piece space. Most, if not all, inexpensive Walmart type bats are made of similar material with the same goal in mind: mass market appeal with a cheap price point and a balanced swing weight. We’ve reviewed a few similar like the 2016 Easton S500. Within the brand, the 2016 DeMarini Insane is similar only in it’s single piece nature. The Insane is built with a measurable endload while the Uprising is intended for the lightest swing possible. Both are handringers for sure, but the Uprising’s light nature adds to the hand sting issue. We’d recommend the Insane over the Uprising IF the player the can swing a heavier bat. The Uprising is a single piece alloy bat with a light swing weight for both a drop 10 big barrel (2 3/4) and a drop 13 youth barrel (2 1/4). The bat’s light swing weight does, however, come at a cost: the bat is prone to denting and will ring the hands massively on mishits. The knob of the bat isn’t flared and the standard grip is as straight forward as you’d suspect. There is nothing notable of the end cap and the barrel size is below average. The paint job does look, at least as I was told by my 9 year old son, “cool”. We hit a few more than 500 balls with the Uprising among a half dozen other hitters. Most of these younger hitters first appreciated the light swing of the bat and were quick to comment how it looked ‘cool’. At the plate a few hand ringers changed opinions quickly and the bats sweet spot wasn’t remarkable. When hit right in the center of the barrel balls did get some decent flight—but off center hits rarely made enough ball speed to get on base. Parents liked the idea the bat was less than $80 brand new and a warranty from the DeMarini brand is often worth being excited about. If you are not willing to spend more than $80 or so on a new baseball bat—and need one now—then the Uprising is probably as good as an option as any. It’s just a bat made out of aluminum that has a light swing and will at least serve a purpose of providing a bat to hit with in rec ball. Travel or comp players will find the bat is prone to denting and doesn’t have great performance outside the perfect center. The Uprising just isn’t a bat for a very serious players and serves a different part of the market outside of the performance bat space. If $80 was our budget, we’d personally use it on a used performance bat in the off season. Amazon, at the time of this writing, had the best price for the Uprising.